A woman accused of stealing a car in Florida had more than just the cops pursuing her. When she got out of the vehicle to flee the scene on foot, she found herself in a pasture in Seminole County, where a herd of cows joined the chase. Aerial footage from the Seminole County Sheriff's Office helicopter shows the driver of a stolen SUV crash into a stop sign, then get out and begin running. A passenger got out and ran into another pasture, while a second person stayed in the vehicle and was later arrested, CBS Orlando affiliate WKMG-TV reports. The driver, identified as Jamie Young, ditched the car, but couldn't ditch the cops. Investigators watched her every move from the helicopter, including her romp around a field with about 20 cows. 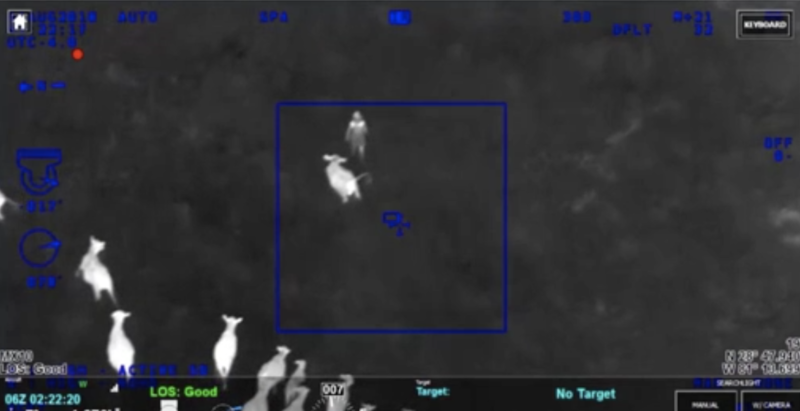 "Actually, a large group of cows is following her for a good visual," the chopper pilot tells the police officers pursuing Young on the ground. As the pilot tracked the woman and cows, he radioed the law enforcement officers below some details. "Looks like they may attack her," the pilot describes. "Keep going southeast. She's pretty far into the field now. If you see the large group of cows, they're literally following her and chasing her." The aerial footage shows the cattle in hot pursuit, as the bovine investigators took matters into their own hooves. At one point, a cow gets so close to Young, it looks like it might gore her, but then it backs off. The animals herd her across the field, where she appears to jump over a fence to escape them. The woman fled the field and hid in a bush, where officers caught her and put her "udder" arrest.